Out of all of the CH kitties I’ve met over the years, Sheri’s Archie is the first I’ve heard about who was impacted by CH after birth. 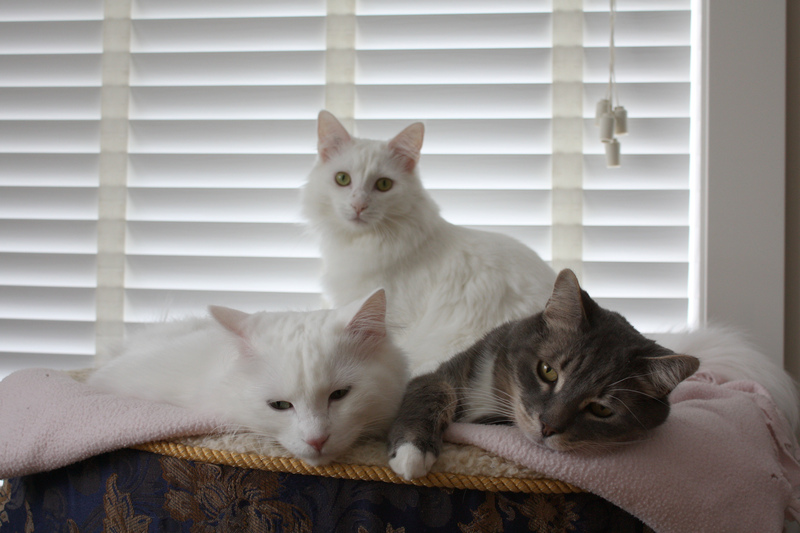 “Nine years ago we decided to foster a kitten from our local SPCA over the Christmas holidays. We called him little kitty because we didn’t want to get attached to him. We had to take him back to the SPCA after the holidays. I had him for two days and on the second night he was quite sick. He was in the litter box throwing up. (Yes, he was that clean – threw up in the litter box). I went to leave for work that morning and he was so lethargic. I drove out of my driveway, and down the street before I turned around, walked back into the house and took him directly to my vet clinic. My conscience wouldn’t leave him – in my gut I knew something was wrong with him. The prognosis was bad – distemper. And they would put him to sleep that morning. I asked my vet why we didn’t give him a chance, she said the SPCA wouldn’t pay the vet bill and his chance of survival was slim. I told my vet that we would pay the vet bill; he had to have a chance to live. Fast forward two weeks; he came out of the clinic just after New Years. He was 12 weeks old, weighed less than one pound and was a scraggly little thing. I had to bring him to work every day for a week because he had to be fed every hour. He would sleep on a heating pad on my desk. I would take a disposable lasagna pan to work every day, fill it with litter and throw it out at the end of the day. He followed me around the office; it was so cute. We decided to keep him because he was such a fighter. We didn’t know that the distemper had left him with CH. I remember going down to the SPCA handing them my vet bill, and telling them I was keeping him and not paying the adoption fee. It was in the next few weeks that we started to notice the signs. He ran crooked down the hallway. He couldn’t jump onto things. He didn’t react to things like our other cat. When you played with him everything was delayed. We would roll a marble down the hallway and he would jump at it after it rolled past him. Our vet then diagnosed him with CH. The distemper had left him with it. We had no idea what this meant. Archie has brought so much joy to my life. I would say his CH is moderate. He can jump, but onto the bed or couch. Nothing higher. He can climb his cat house like no cat I have ever seen. He can’t really run but flops. He walks with a swagger. If he runs through the house, he may run into a wall. 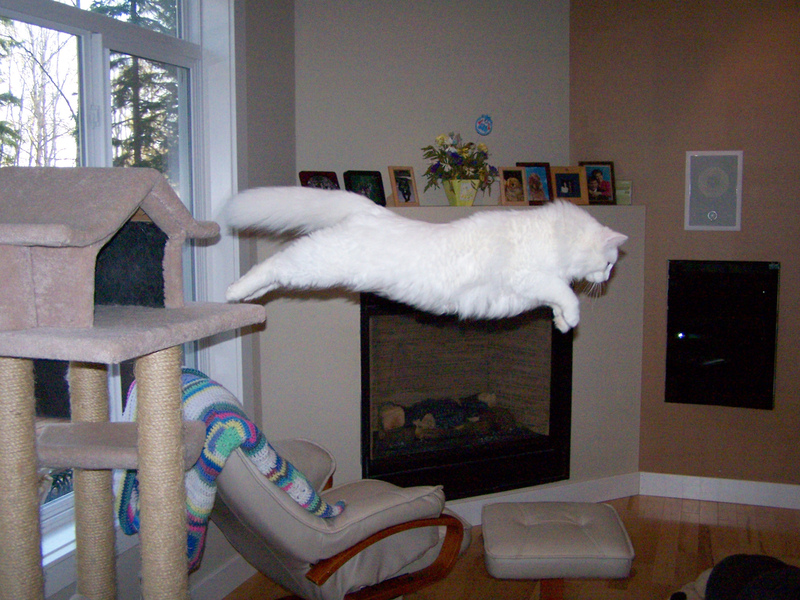 He can’t jump straight down (no depth perception), but instead flies (literally flies) from his cat house to the couch where the landing will be soft. He is pretty good with the litter box but not great. If it isn’t completely and spotlessly clean, he will poo in front of it instead of in it. He NEVER pees in the house. He uses his litter box standing up. He only eats one brand of cat food. It has taken us nine years to get him to eat chicken, only chicken. He eats at 7 am and 5 pm on the dot. He can be asleep all day, and as soon as 5 pm rolls around he walks into the kitchen and sits at his food dish. He loves being outside with us (my cats are indoor cats but Archie loves to garden with me.) I will spend hours in my yard and he just lays beside me wherever I put him. And purr. If he starts to wander a bit from me my border collie herds him right back to me. Archie is the happiest cat in the world. He purrs and purrs. And he is attached to me. He will follow me all over the house. My husband less so. 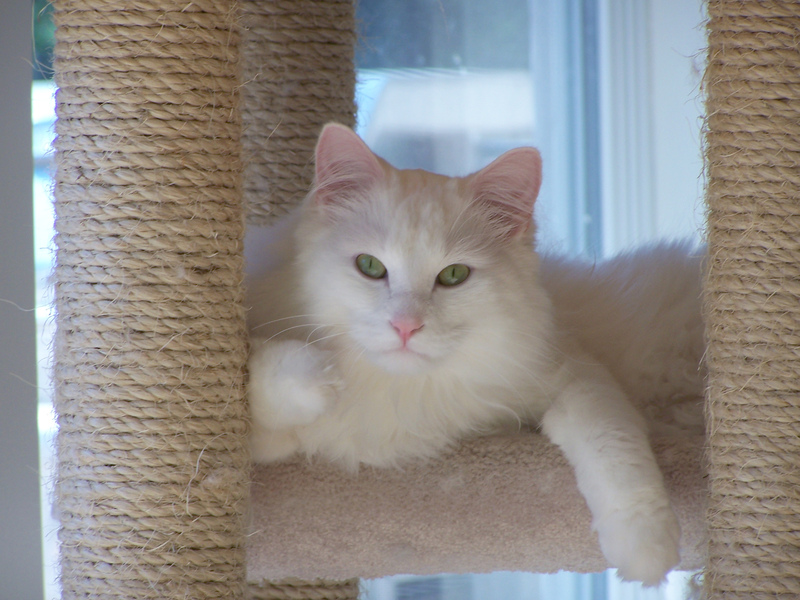 Because of Archie, we adopted a deaf cat Mojo. I will never have a “normal” cat again. I cannot believe the joy he brings into our life. I find it interesting how we have adjusted our life to Archie. What a beautiful cat and an inspiring story. I agree, an inspiring story and a great. loyal cat!